These photos were submitted by David Brashears, one of the paddlers who enjoyed a 2 day, 21 mile paddle on the New River from FR 22 to Pope’s Place Campsite on the river. Stopping for lunch along the upper river. The group camped at campsite 17 on the east side of the river the first night. The second day’s paddle, stopping for lunch at Gully Branch landing and campground. The group then paddled another 6 miles to the take-out on the west side of the river, Pope’s Place campsite. The weather was great, the river 18 inches lower than a week ago when a scouting and clearing party prepared for this trip. When the deciduous trees begin to leaf on the New River, the water is drawn quickly. In a dry spring, there will only be pockets of water in the upper section, waiting for summer rains to replenish the river. Early spring brings the best chances of paddling, rather than walking, this stretch. This entry was posted in New River, North Florida camping, Paddling North Florida, Paddling Tate's Hell State Forest, Tate's Hell State Forest, Tate's Hell State Forest camping and tagged New River, Tate's Hell State Forest paddling on December 6, 2017 by marylynanded. Womack Creek, a tributary of the Ochlockonee River, on the west side of Tate’s Hell State Forest, has only native plants and trees. 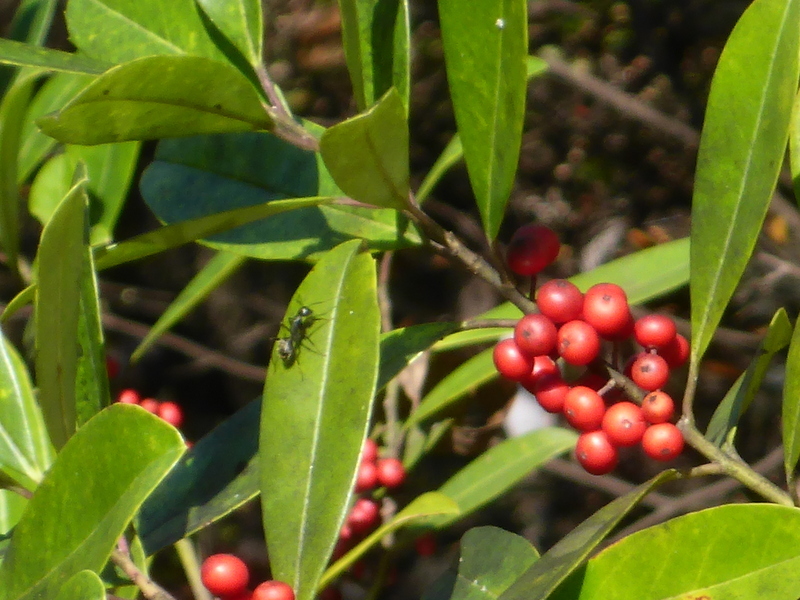 There are three varieties of native hollies on that creek: Yaupon, Dahoon and American holly. 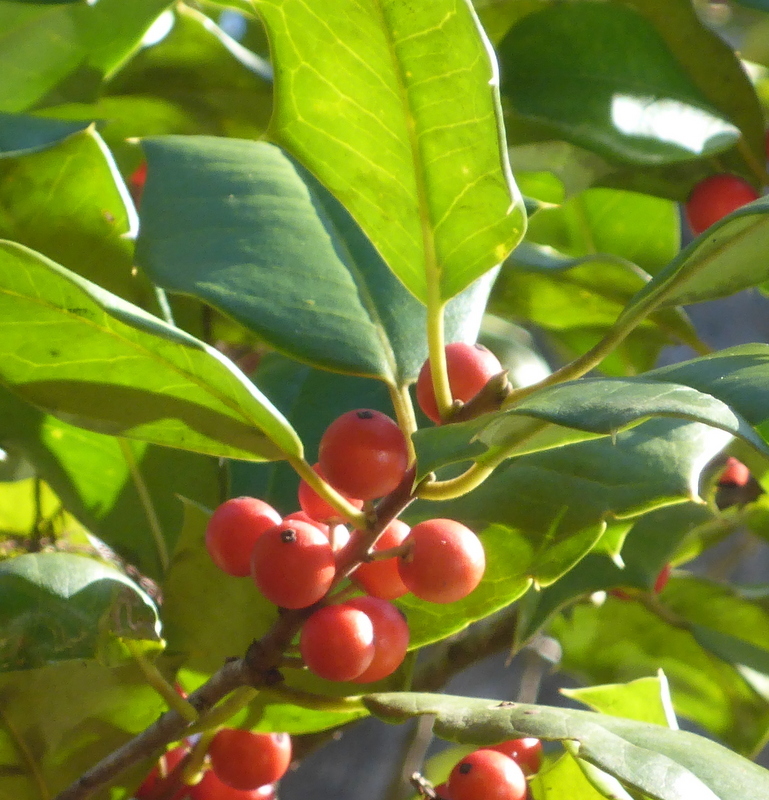 The American holly is what is what folks usually associate with holly, with its prickly scalloped leaves (above). As in most natural habitats (as compared to managed landscapes) every year is a mix of blooms and seeds. Some years the white flowers of one or the other holly is more pronounced. 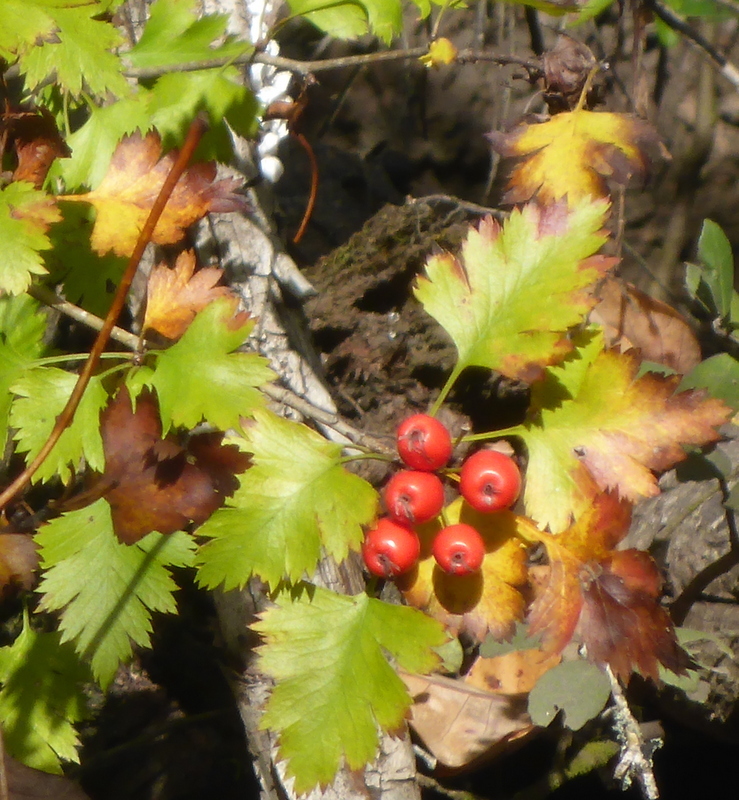 But that doesn’t guarantee that that particular species will have more red berries — between March to December anything can happen. 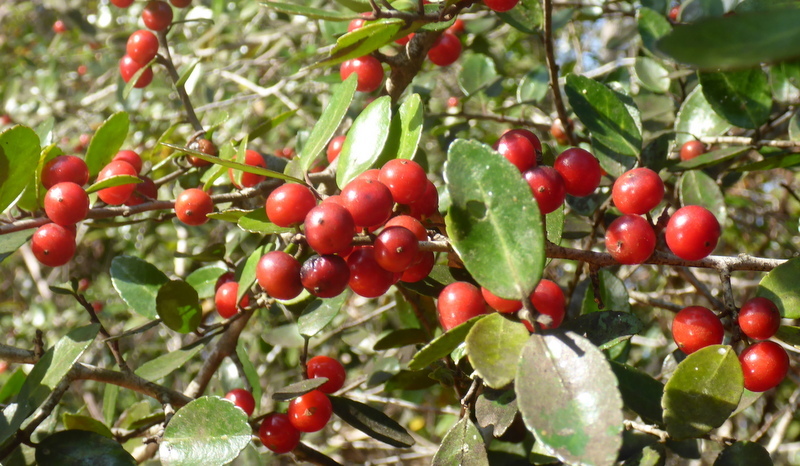 This year there were more red berries on the American holly than we have ever seen since 2012. Usually, the dahoon holly is the dominant and heavy bearers on the creek. The bushes are not as full of berries as in previous years. Yaupon holly, part of the pharmocopeia of native Americans, with its smaller leaves, tiny flowers and smaller berries, is less showy. 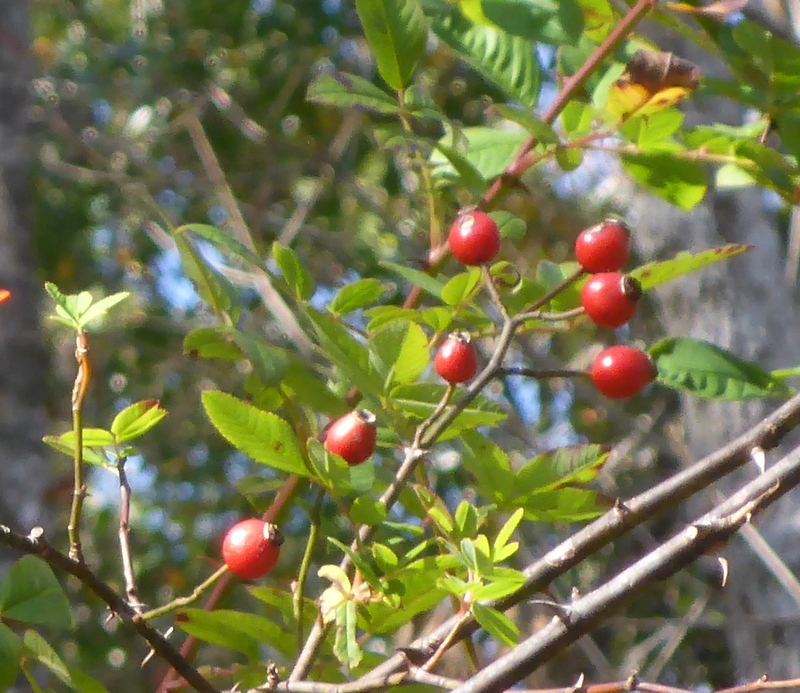 To the careful observer, the red berries of the parsley haw tree can be seen. That tree is increasing in numbers as the hornbeam trees are losing their grip on the land and landing in the water. Swamp rose blooms were sparse this year, but a few matured to add reds to the creek’s palate of colors. Ever season has its dominant colors; every year that mix changes. This entry was posted in Native Wildflowers, Tate's Hell State Forest and tagged Florida native wildflowers, Tate's Hell State Forest on December 6, 2017 by marylynanded. See How to Find Tate’s Hell SF Campsites on Reserve America posted on 12 February 2019 to help you find the right campsite when on the Reserve America site. We had to figure this out because it was impossible to find the right campsite on Reserve America. Search by “How to find”. Then call, Bin Wan, at 850 681-5963 (Talquin District State Forest) or e-mail Bin.Wan@freshfromflorida.com for information on how that campsite is listed on Reserve America site before you access the reservation site. Certain sites are not available during hunting season and you may not want to be near these sites if you are not a hunter. Womack Creek Campground is in a no-hunting area with 12 sites, 3 with electricity and set up for RV’s. The fee is still $10 plus less than $4 for the Reserve America fee. This entry was posted in North Florida camping, Tate, Tate's Hell State Forest camping and tagged Camping Tate's Hell State Forest, Tate's Hell State Forest camping on December 1, 2017 by marylynanded.